I can't believe how much of life we are living outside in February. It is wonderful. 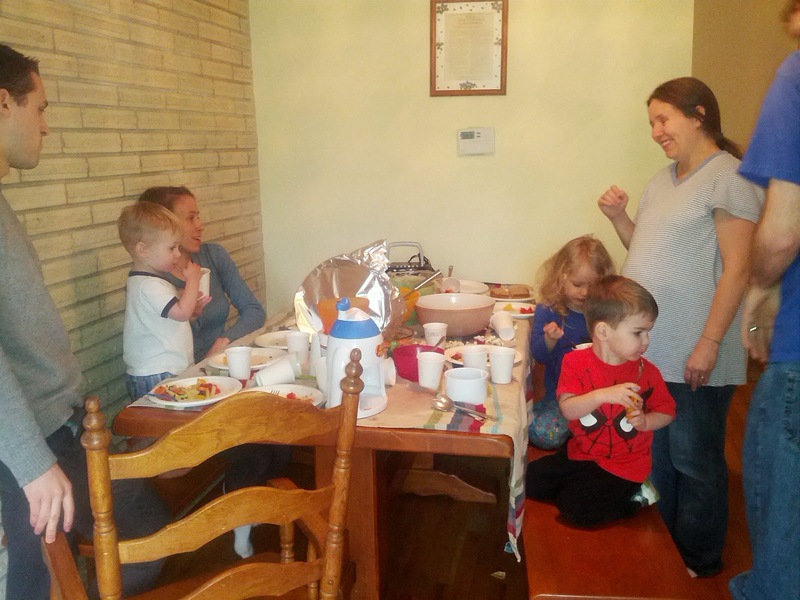 This is a picture of a picnic we had on our porch after a very long walk on a day when the temperature hovered around 60 degrees. Unexpected warm weather makes homeschooling really fun. 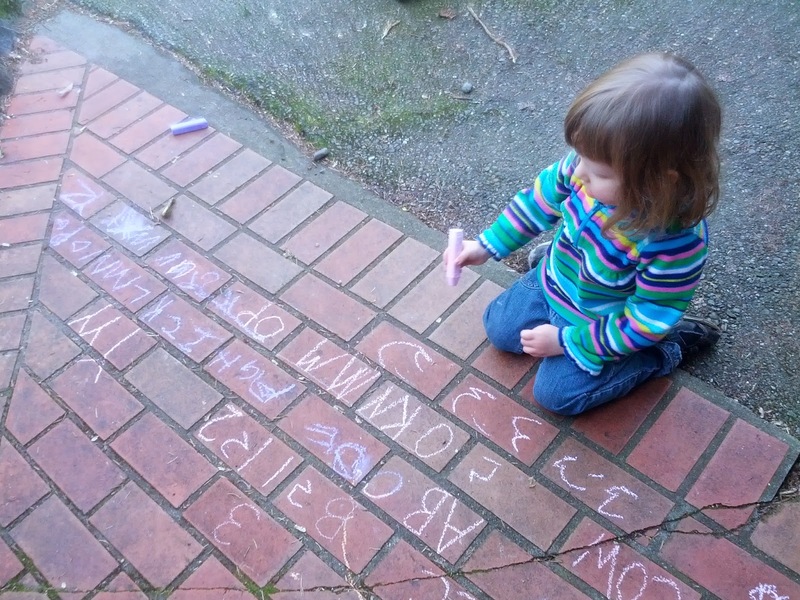 We practice writing letters and numbers using our porch bricks as the lines, and then we play a math game I invented that involves finding the sum of dice rolled, and then Jared tells Eloise or Eloise tells Jared what activity to do that number of times. Eloise was all for running dozens of laps around the car (she is getting ready for soccer to start in April). 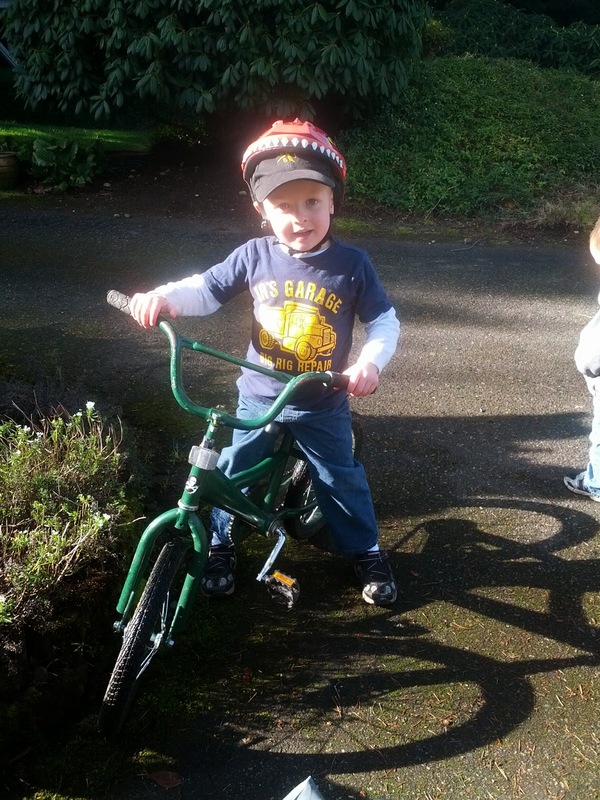 Jared mostly wanted to ride his bike back and forth or climb so many tree branches. After church last Sunday, Jared informed me that Dorothy is is best friend, after Eloise. Eloise immediately adopted Dorothy's younger sister, Alice, as her best friend, and B enthusiastically joined in asking for a play date with Beatrice, the sister his age. 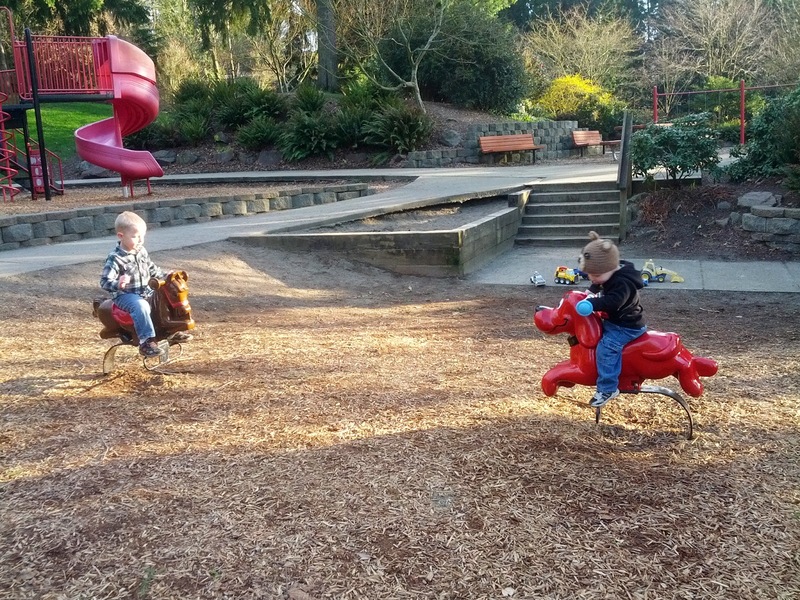 Since we still have the runny noses, I thought it would be best to meet somewhere neutral, where they wouldn't all be sneezing on the same toys, and since the weather continues to cooperate, we had a great play date at the park. On Thursday, our washing machine burned up. I mean I literally smelled burning when I tried to turn it on. Todd did some investigating and discovered that our washer was thirty years old, so we decided to get a new one. A bigger one. It should arrive on Monday. In the meantime, the Christensens were nice enough to let us do laundry at their house on Friday while Rebecca and I took turns vacuuming out our cars, and the children rode bikes up and down the driveway, read books, dug in the dirt, ran amok in the playroom, did puzzles, and enjoyed playing together. 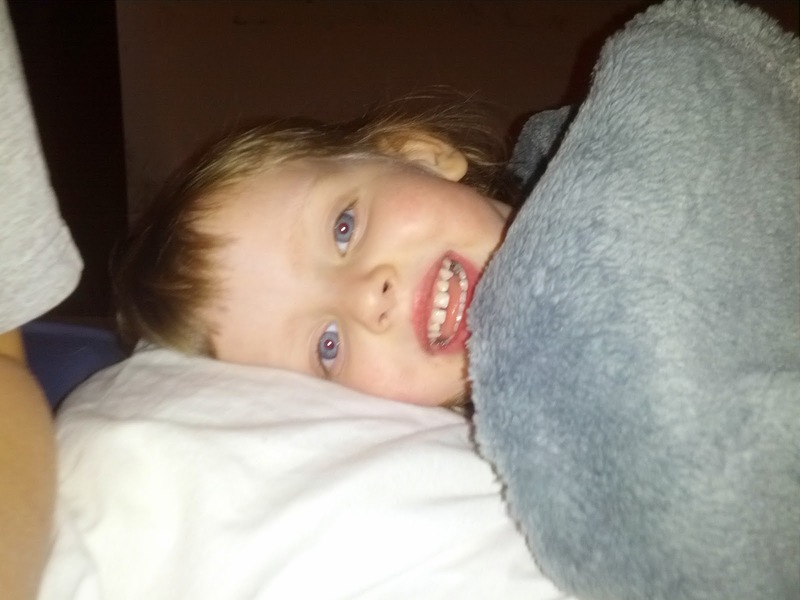 We walked around the block to Todd's office to join him for lunch, and B even napped in Price's bed. I am so glad to have them as friends. This morning I had a feeling that these kids needed a special day. 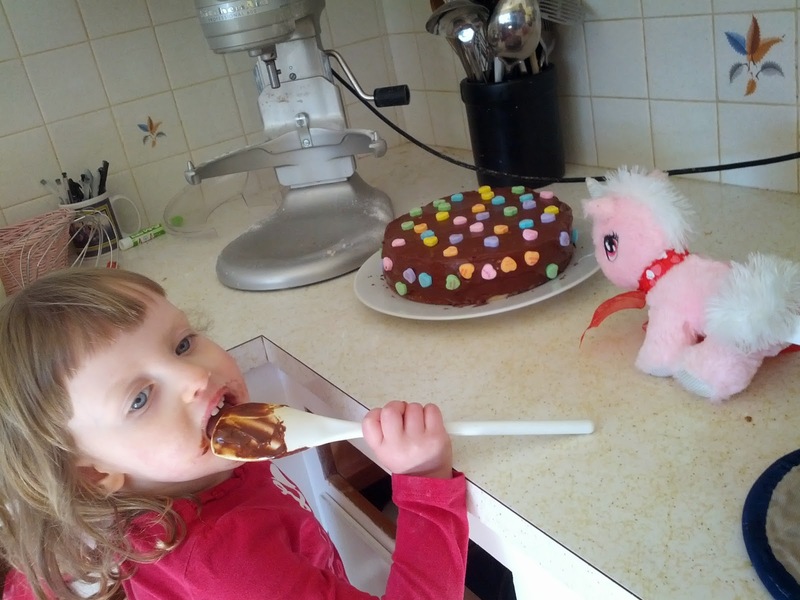 Eloise has been telling me for a few days that her unicorn (she calls it her pony named Tod) had a birthday coming up, and today was Jared's actual half birthday, so we decided to have a little party. Jared made this white almond cake while I made breakfast, and I frosted it during lunch. The Christensens came over, we went for a walk in the woods, ate lunch, and then made cards, sang "Happy Birthday," got out our Rockem-Sockem Robots to play with, and enjoyed this cake, which Eloise decorated in conversation hearts. It was a special day. Grant even made Jared a half birthday card with lots of pictures of half of things. Here are a couple of pictures of the greatest guy in the world. You can't see him because he is letting children harass him. Today he and Cambell hauled our old washer outside, rewired our furnace so that it uses a plug, so that we can connect it to our generator in case of a power outage, and FINISHED THE KITCHEN CABINETS!!!! And now, the moment you have all been waiting for: the new kitchen! Disregard the holes above the stove where the old microwave was, and the new hood is going to go. I have been wanting the cabinets to be white since before we moved in three years ago. Todd has been slaving away for three weeks to make my dream come true, and it looks every bit as much better as I thought it would. 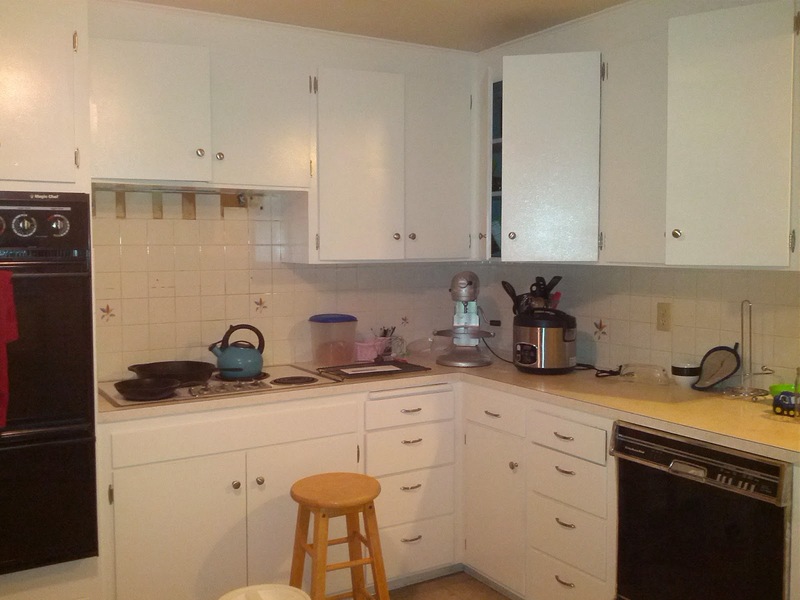 For old pictures of the kitchen (and some adorable little tiny Jared faces), please see this post. Todd is so good to do all of this work for my nesting. 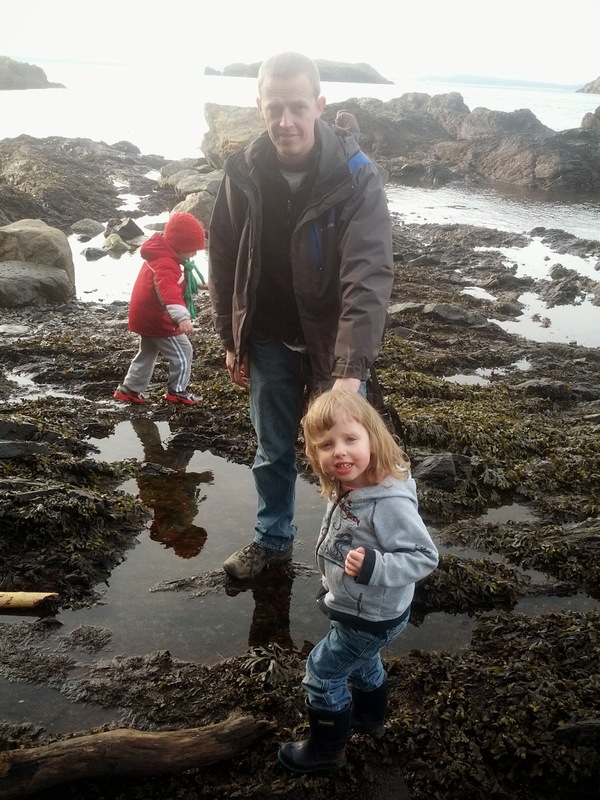 We were due for a family adventure, so we took President's day afternoon (February 16) to drive to Deception Pass State Park and visit the tidepools. Rosario Beach, where the tidepools are located, was closed so that we had to park outside of the gate, and the bathrooms were locked. This was bad news for the bladder with a baby resting on it after the hour and a half drive to get there, but it gave us an opportunity to see some other parts of the park as we looked for an open bathroom. 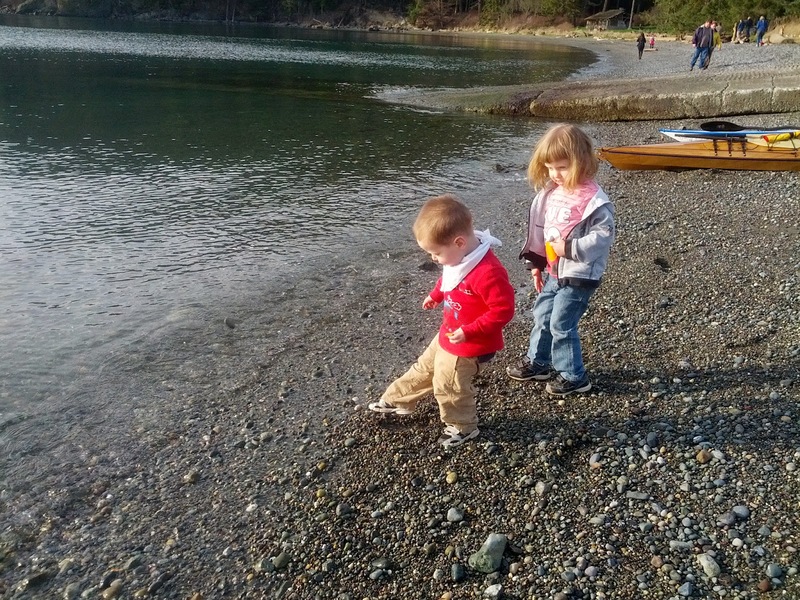 We discovered Bowman Bay, which has a playground, a rocky beach, and a fishing pier. 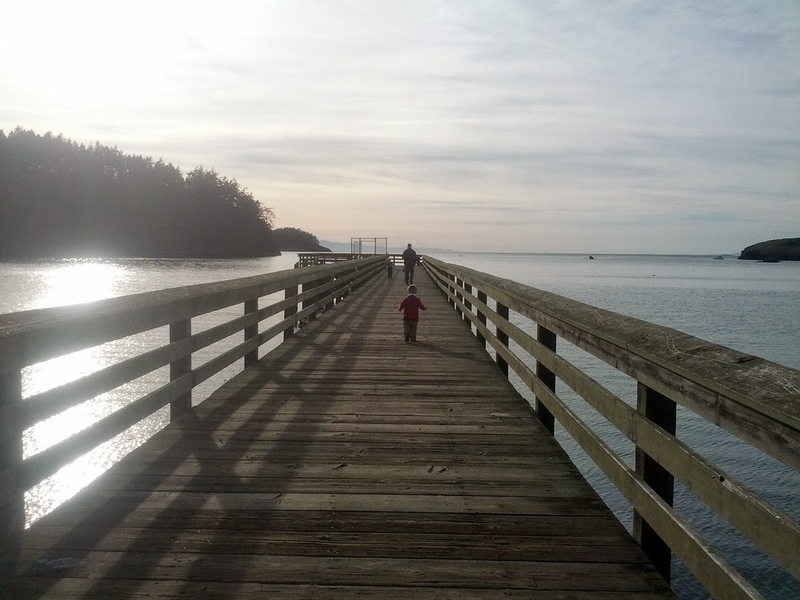 The Christensens were meeting us at Rosario Beach at low tide, so we had a little time to kill running races on the pier. I couldn't get them all to look at me for the picture, but they were all looking in the same direction. I think they saw a seagull. Low tide was around 4:15 p.m. The rocks are slick and sharp with barnacles under the seaweed, but this time we were prepared for the chill of the wind on the water. Honestly, I think it was probably comparably cold this time to last time we came here. 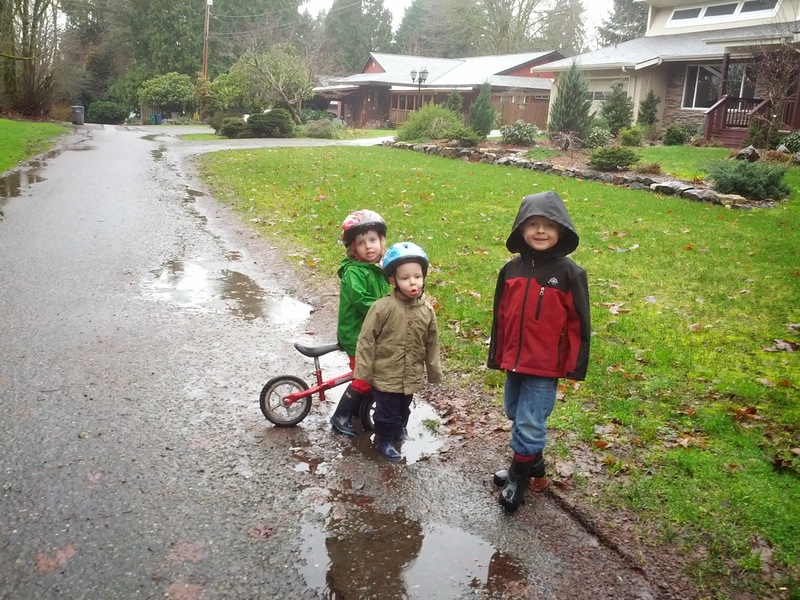 The long pants and boots did protect the kids from scrapes, though. Grant got the only injury when he fell hard onto one of his hands and got a small gash. 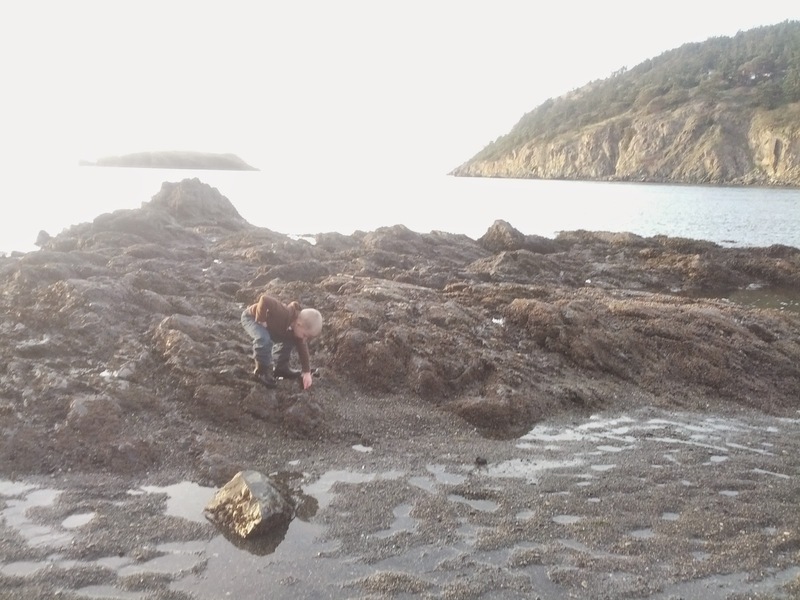 As always, the pools were alive with moving crabs, anemones, limpets, sea snails, chitons, red algae, mussels, barnacles, and lots of other things that we haven't learned to identify yet. B discovered the joy of watching anemones close up after you touch them, and went from pool to pool looking for anemones. I was impressed that he learned to identify them on his own. 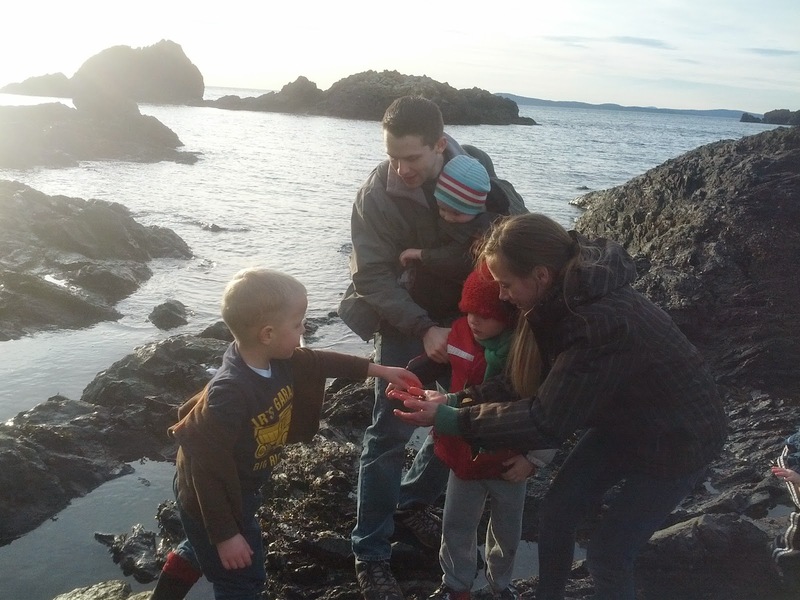 When it was starting to get late, we herded the reluctant kids away from rock scrambling and crab watching to throw rocks into the water along the beach. This was a treacherous outing for me, since my balance is terrible with my skewed center of gravity, but it was worth it for this beautiful day at the beach. I had planned on B napping in the car on our way to the tidepools, but he didn't. 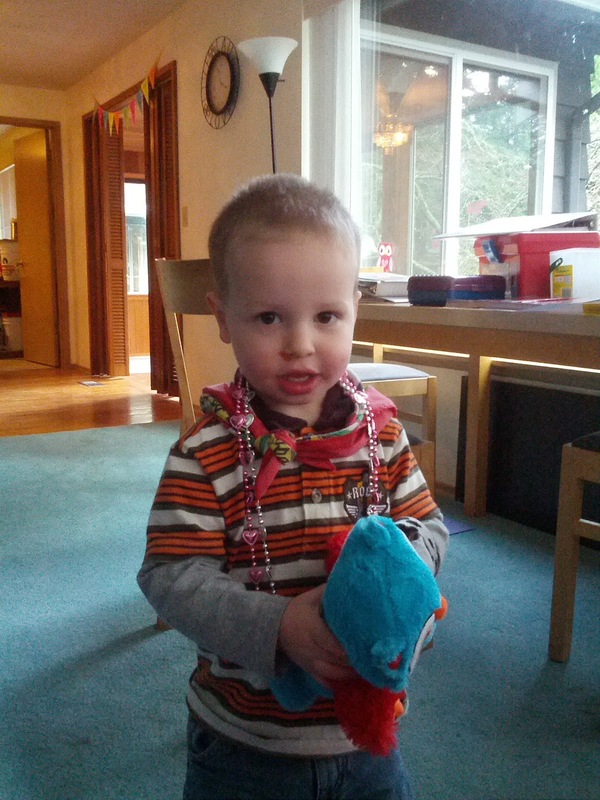 He held up pretty well for most of the time, with only a few problems with impulse control. At about dinner time he fell apart and threw a tantrum because I wouldn't let him bring Max's bike onto the beach with the deep, coarse sand. That was our signal to move off of the beach for our picnic. 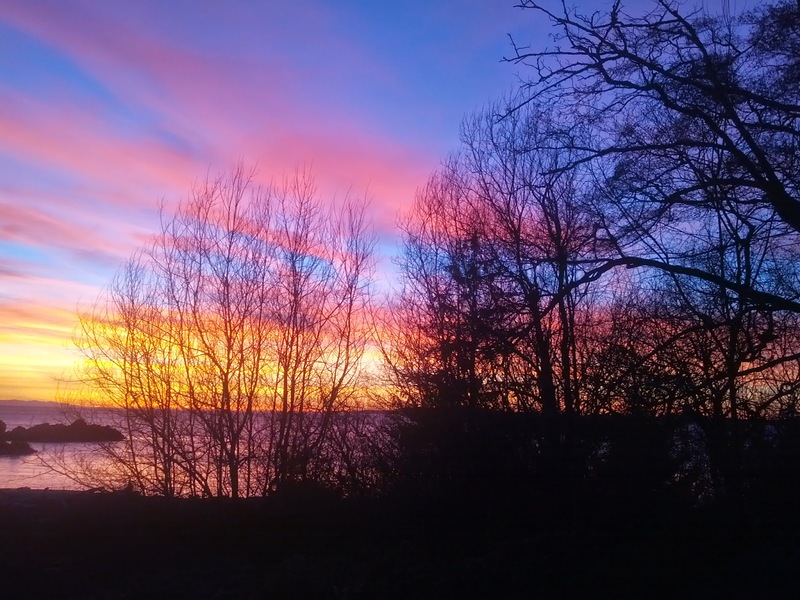 We had a beautiful sunset view of Puget Sound as we ate dinner (and froze a little more). 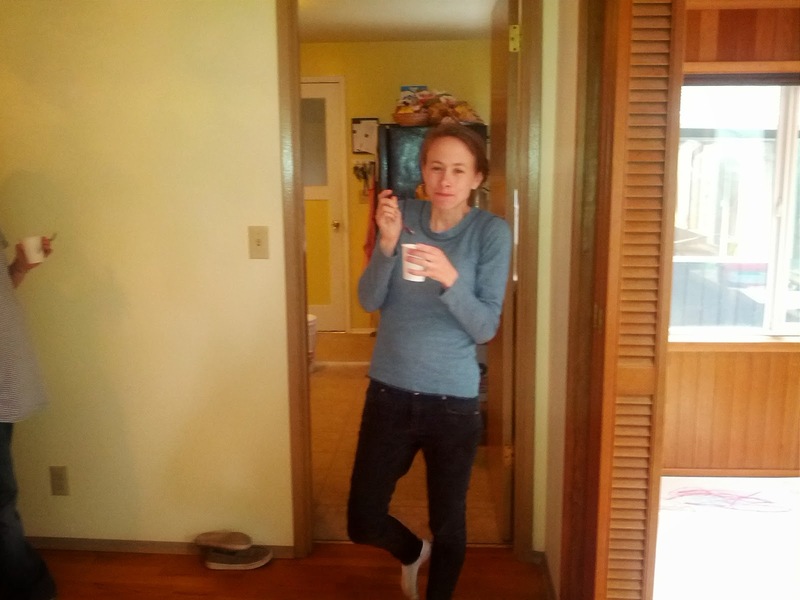 By the time we were done eating, we were ready to warm up in the car, make one last stop at a bathroom we found at a nearby boat launch, and head home. I'm glad we decided to delay the completion of my kitchen cabinets to have an outing together. It was just what our family needed. If this day wasn't already perfect enough, we got word right before we left for this adventure that my sister, Cheyenne, had delivered a healthy baby girl! Welcome to the world, Victoria Christine Warnock! We can't wait to meet you. Well, it kept raining here for a few days, and we thought that winter might be back, but it really isn't. Bushes are blooming and bulbs are sprouting, and the world will not be convinced that it is actually still February. 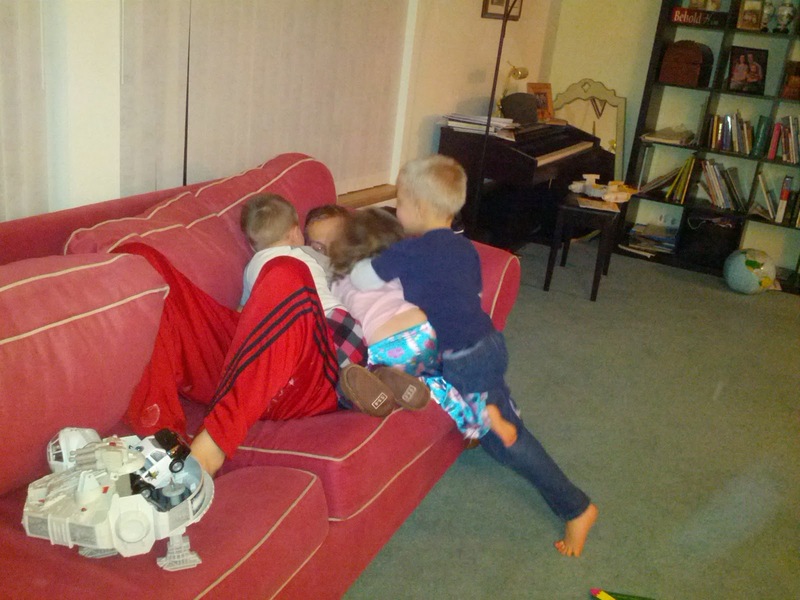 Time seems to speed up for me, too, when my days are spent playing with these little goofballs. We have a new rule that the amount of time spent in front of screens cannot be longer than the amount of time already spent outside in a day. Usually we spend much more time outside than in front of screens, but the possibility that a missed dog walk will mean a missed video later in the day effectively motivates three little people to put on their shoes and jackets in the mornings, no matter what the weather looks like. Rainy days are great for "creature rescues," otherwise known as picking up worms from the road to put back in the dirt. Me: What if we named our new baby Todd? Eloise: Just like in "The Fox and the Hound!" Me: Yeah! Also like your daddy. Jared: The one in "The Fox and the Hound" only had one D. Daddy has two. Eloise: But the new baby should be named Adam. Jared will be sad if it isn't. 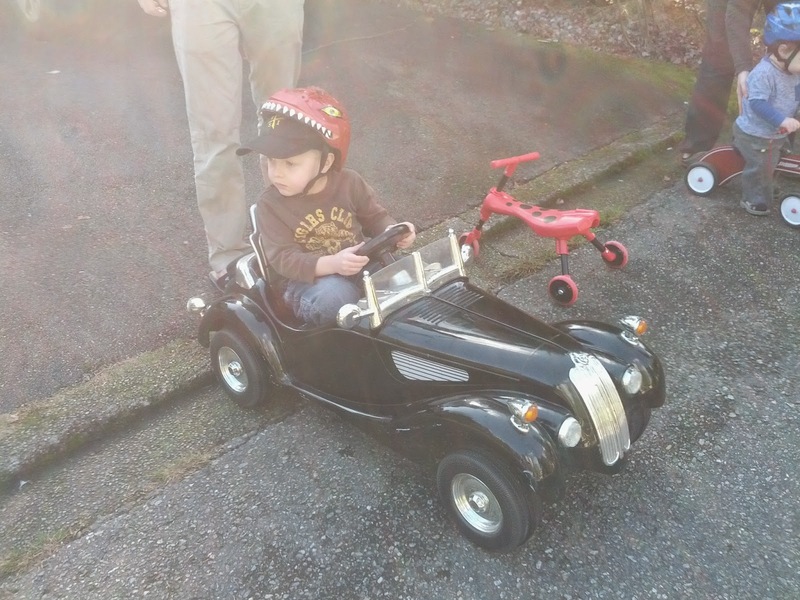 We stopped on one of our walks to see if our neighbors wanted to come ride bikes with us, and got horribly sidetracked by this little electric car. I don't blame them. I wish I could drive this hot rod. Also, it played children's songs with a dog barking in them. 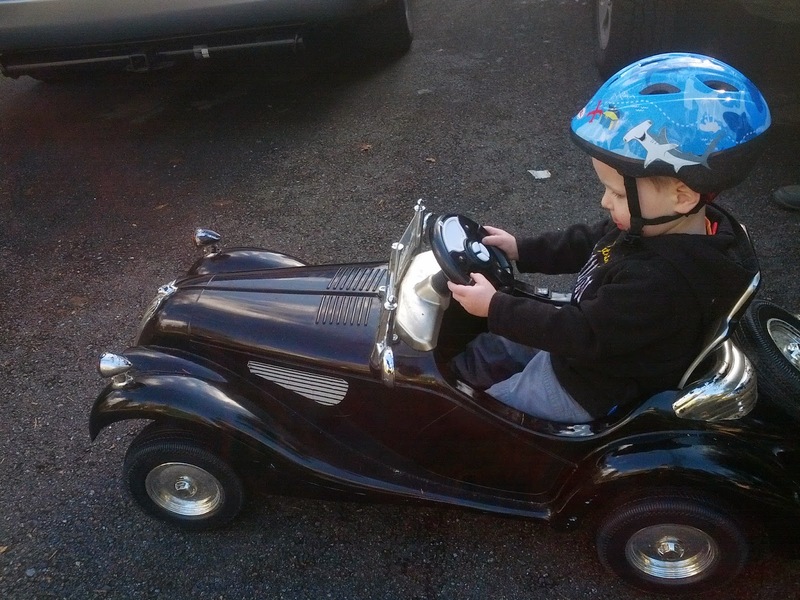 B cried when we put the car away. As you can see, the sun has returned from its brief disappearance. We Knights are making the most of this glorious weather with lots of bike riding, swinging, and trampoline jumping. What? You don't have a pond form in your driveway every time it rains? 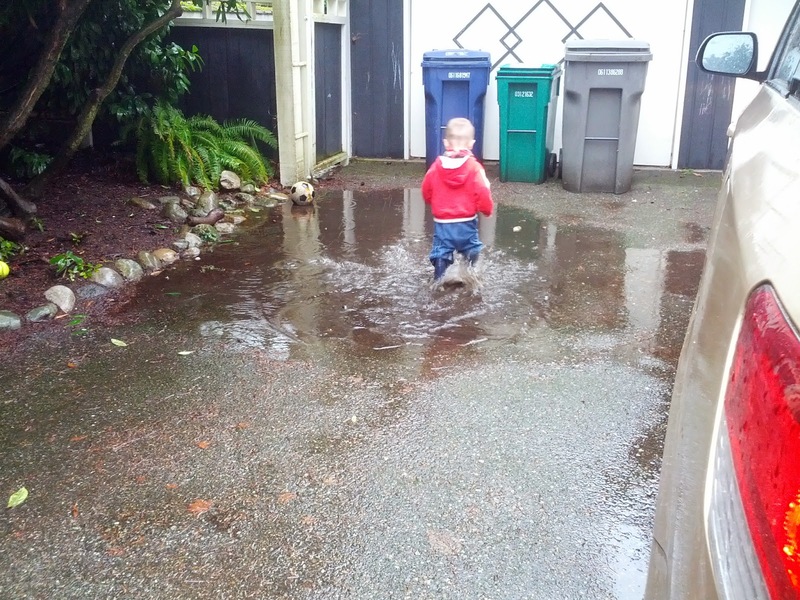 Your child isn't compelled to run into every single standing puddle or patch of mud that he comes across? 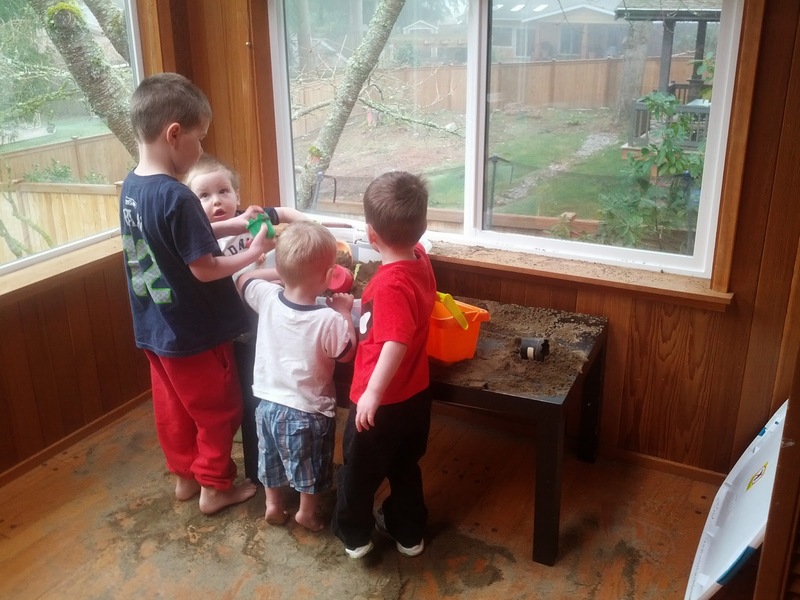 Do you let your two year old out of the house when it rains? 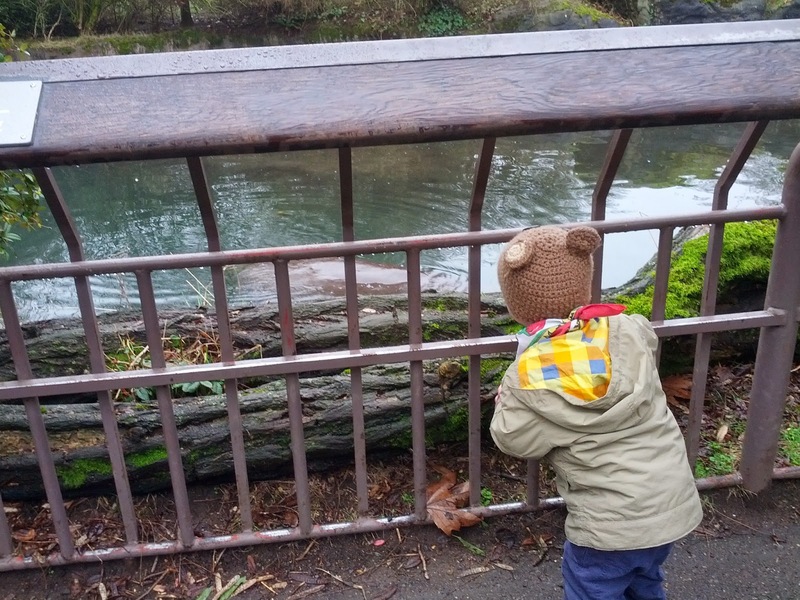 I'm afraid that this little man will not be kept indoors, or out of the puddles, which he splashes up to his belly button, even if they are only as deep as his ankles. 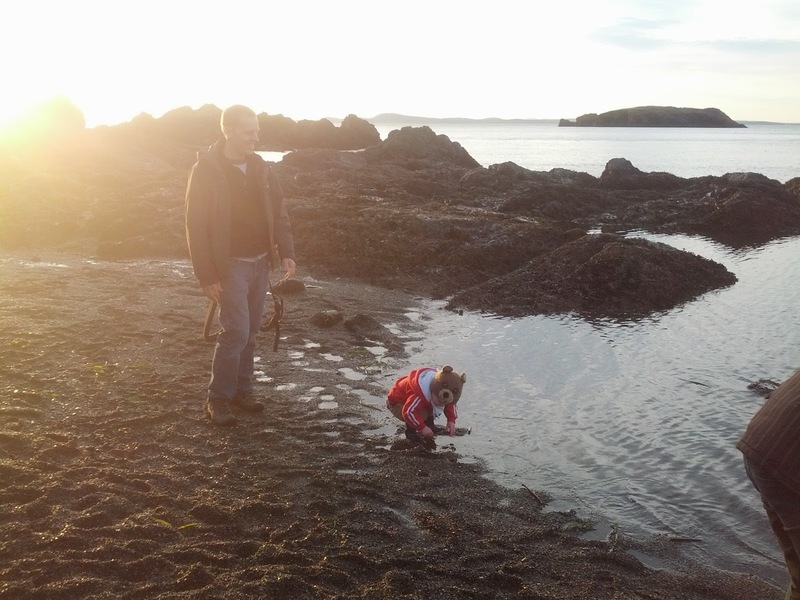 When he isn't running through puddles, he is picking up rocks and mud to fling into them, so that he ends up having a bath almost every single day, even on the days when baths aren't scheduled. It's a good thing he is cute. 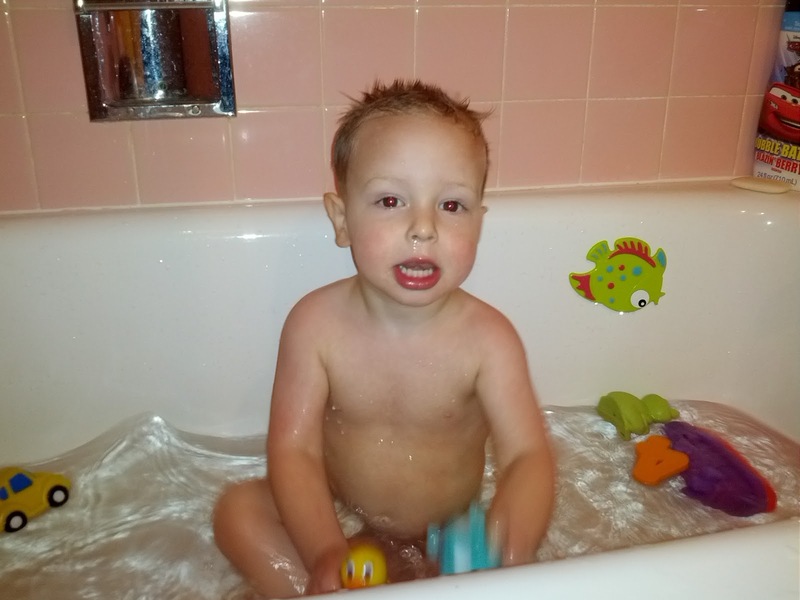 I just wish he didn't feel like he needed me with him for every moment of his bath, when I often have one of his siblings in another shower at the same time. My boys got haircuts this week. B screamed and squirmed for the whole thing. I held him on my lap as I cut his hair, but the screaming and squirming explain the mystery of the couple of spots on his head that are not nearly the same length as all of the other hair. Jared, who hates the hair falling in his face, sat very still for his haircut. 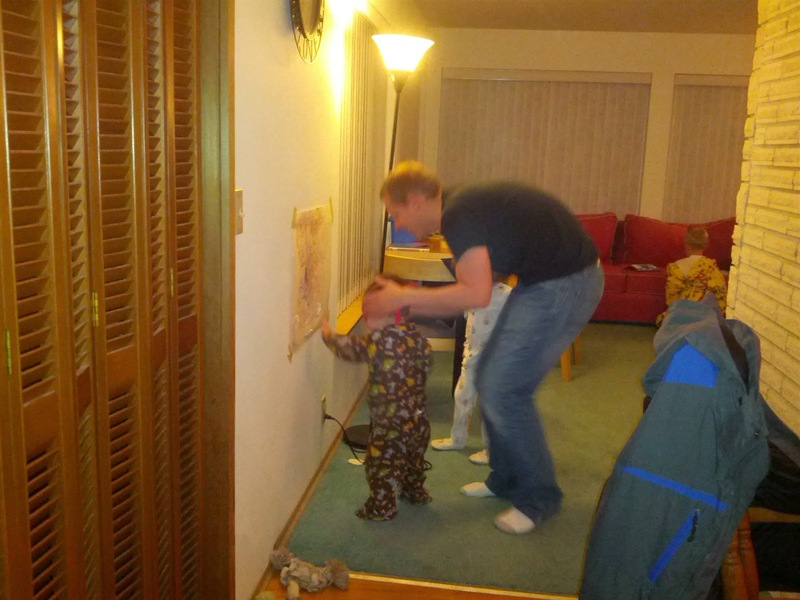 This is probably because I had an episode of Wild Kratts playing for him to watch. We got an amazing Valentine package from our cousins this week. Thank you Campbells! Jared had asked me the day before if he could request a package from someone containing skittles, and the next day, out of the blue, your package arrived, full of skittles. Jared remarked that the skittles must have been Rachel's idea, because Rachel is so cool. At any given moment, someone can be found wearing a heart necklace or two, and B accidentally slept with a slap on bracelet the first night after the package arrived, since it was tucked under his sleeve and I didn't notice it. He loves this fuzzy owl, and it has gained a rare place on his bed where only Elmo was permitted in the past. If B loves the owl, it is nothing to how Eloise loves the unicorn. It has gone everywhere with her since the package was opened, and is starting to look a little worse for wear already. Jared and Eloise have discussed at length whether unicorns should be winged or not. Jared thinks that a Pegasus unicorn would be more interesting. Everything that relates to Greek mythology is more interesting to Jared. 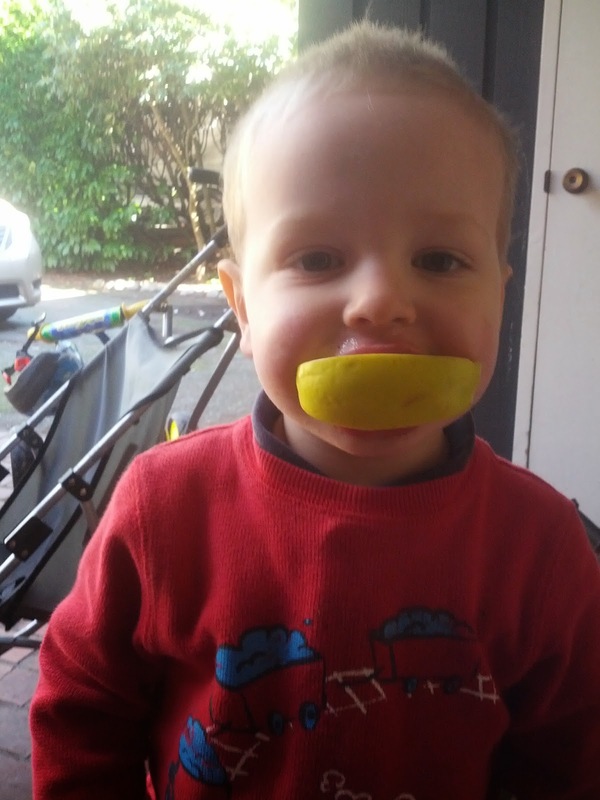 He was deeply disappointed when we couldn't find a pomegranate at the grocery store, since he had wanted one since he heard the story of Persephone in the underworld. He says his favorite story is the one of Athena being born from Zeus's head. It is exciting to rediscover how many references to Greek mythology can be found in our culture. 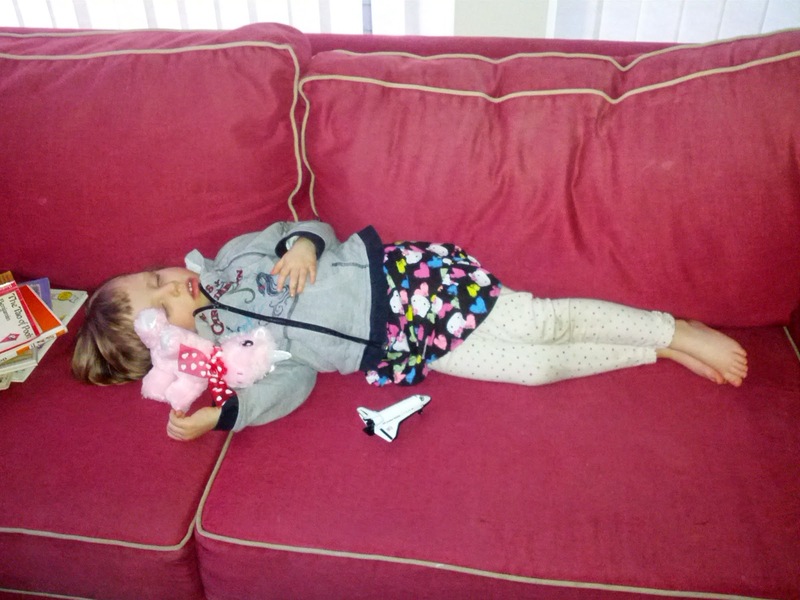 I guess that the house was a little quiet with us gone. 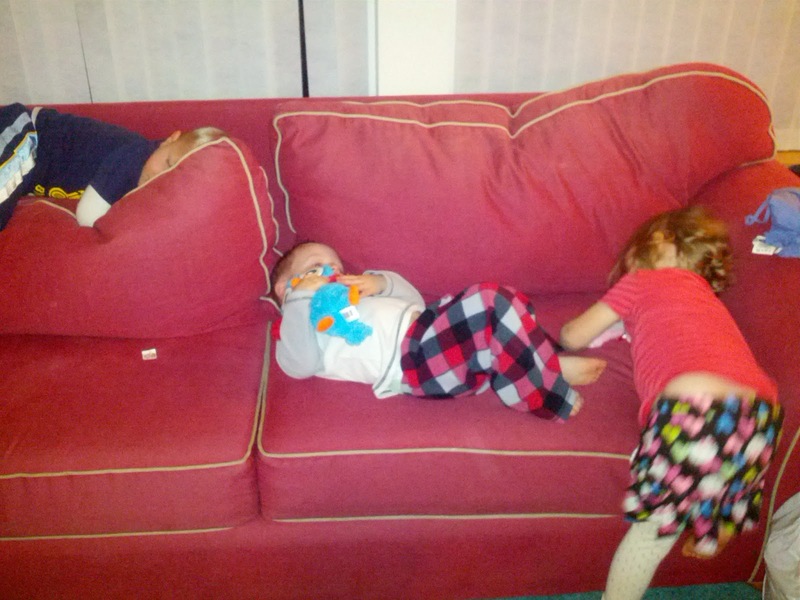 B was first alarmed by finding Eloise asleep on the couch, and then he thought it was hilarious, so he tried to copy her. The others saw the camera come out and decided to join in the fun. We did start making Valentines to send to cousins before we got our Valentine package, but then we chose this weekend to disassemble our kitchen so that the cabinets could be repainted. Todd and Jordanne have been doing all of the sanding and painting while I keep the kids out of the way and attend to all of the other housework. 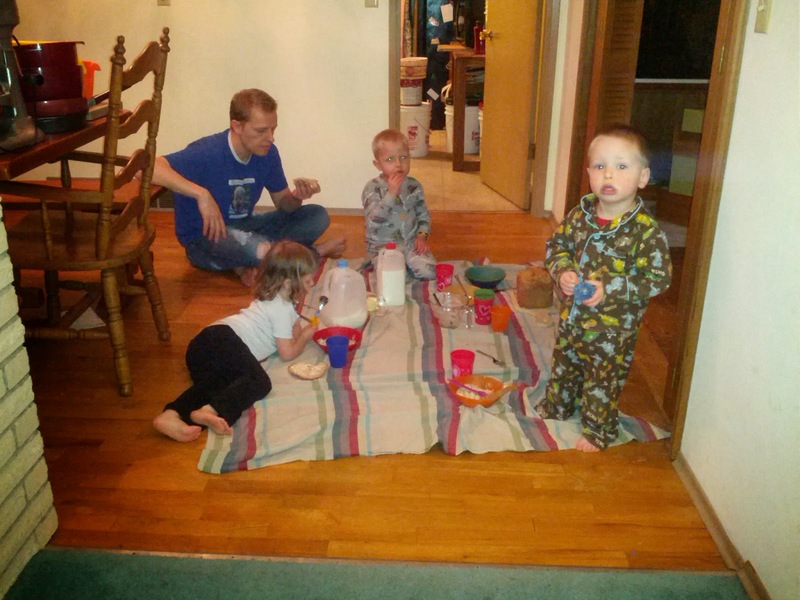 This is how we eat breakfast, lunch, and dinner until we are done putting coats of paint on the cabinets, the paint is dry, and we can move everything off of the tables and back into the cabinets. So probably until Tuesday. Maybe we will be able to dig the Valentines out of the wreckage, finish them, and get them sent this week. The new, realistic goal is to get them sent by March. I'm sure you will all be pleased to know that my cabinets are going to look great. That should more than compensate for the staleness of the candy. Happy Valentine's day! 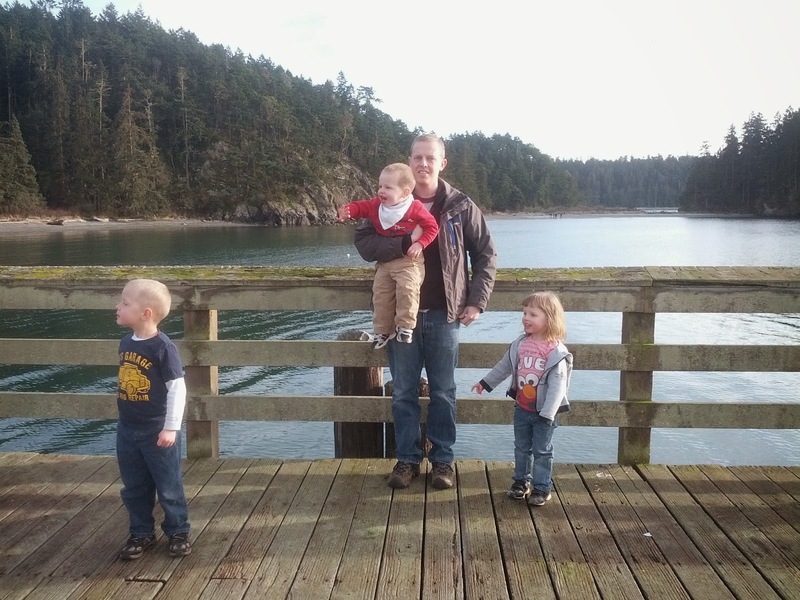 When we went to Fort Casey, we bought the annual parking pass for all Washington State Parks. 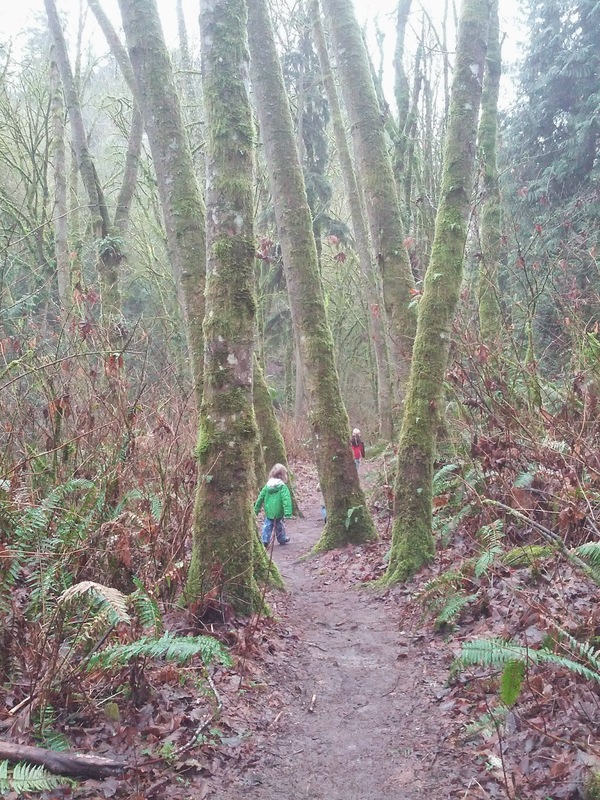 Since we have a state park nearly on our doorstep, we decided that we could drive there and wander around on some of the paths that we hadn't attempted yet since the walk from home to the playground always does us in for further exploring. Our stated objective was to find the path that leads to the shore of Lake Washington, but everyone acknowledged and agreed that it was fine if we didn't make it on our first attempt, and we didn't. 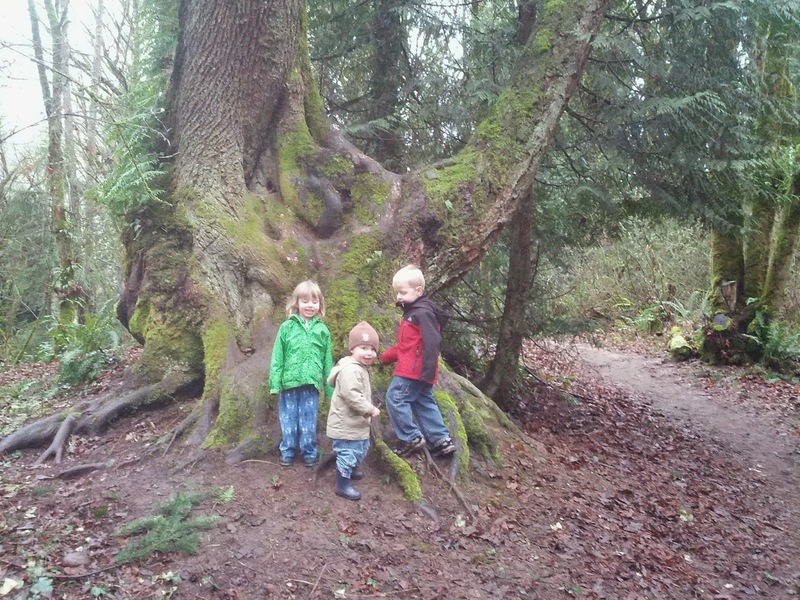 We did find this really cool clump of three trees that has grown together at the base. Jared thought that some of the holes in the giant trunk base must have gnomes living in them. I tend to agree. The day was a little rainy and cloudy, but we walked down into a ravine and found everything coated in a neon green moss, and heavy with fog. I don't think that this picture really captured the effect of it. How is this forest so beautiful in the dead of dreary winter? 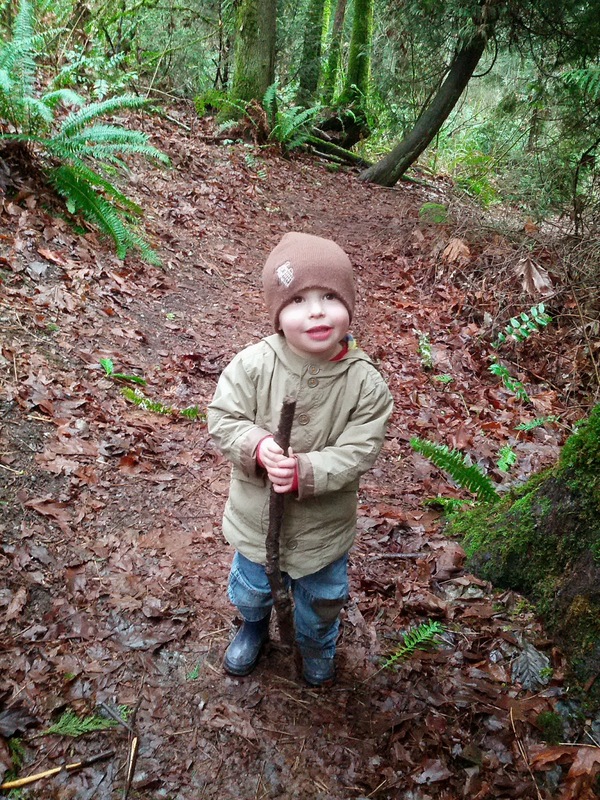 B's legs were tired until he found this walking stick. Winter has returned in earnest, and so everything was soaking wet. The path was slick with mud. B fell in the mud once, and was busily contemplating the mud on his pants in the middle of a narrow place on the trail when a runner approached him from behind, his footsteps muffled by the dampness of the ground. B looked up and found a six foot stranger looming inches away from him, let out a shriek, and started running up the trail as fast as his little legs would carry him. B has serious stranger anxiety lately. He hasn't even enjoyed going to nursery at church as much as he used to. 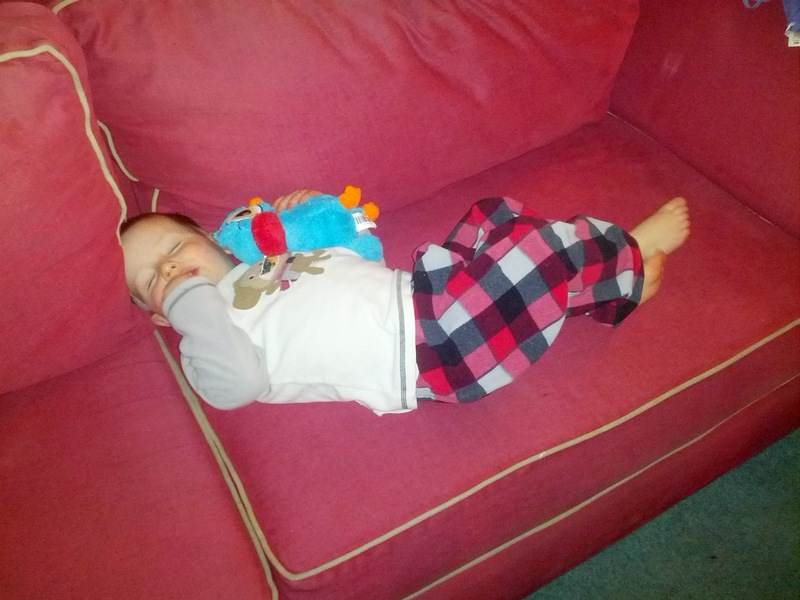 Maybe he senses his position changing as our baby's birth approaches, or maybe he is just responding with normal toddler anxiety to his increased capacity for independence. 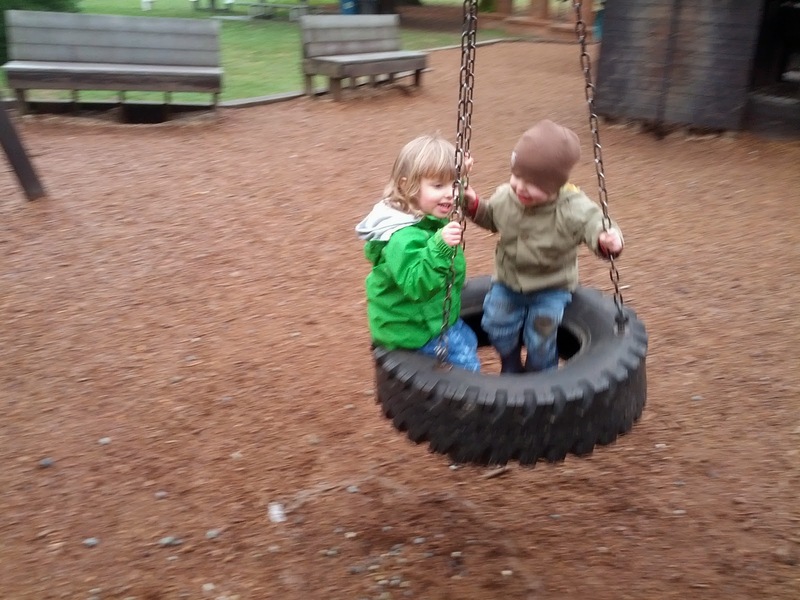 We turned back in time to spend some time on the soaking wet playground before heading home. We came back later in the week with the Christensens and found the actual trail to the water. We were within a stone's throw of the beach when we remembered that it was a school day for Grant, and had to turn around. We will make it to the water one of these days. Next time we will have to bring snacks, though. It was a long way down, and the Knight team was not pleased about having to turn back when the goal was so close. B hit a wall about ten steps back up the trail and insisted on being carried nearly all of the way back to the car. His 30 pounds felt like a lot more by the time we reached the top. Was I ever a pregnant, sweaty mess by the time we reached the top! Thank heavens for Rebecca, who can always turn bad attitudes into adventure with stories about mountain lions, bears, and shark attacks to make the long, steep, uphill trail seem short. 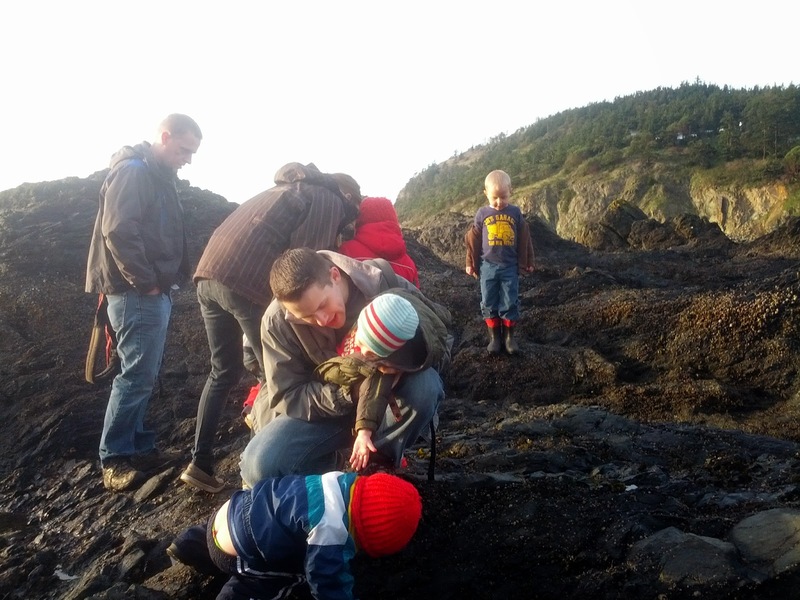 All of the children arrived at the top of the trail looking as if they had been rolling in the mud (I'm not sure that they hadn't), so Grant went to kindergarten in Jared's clothes. 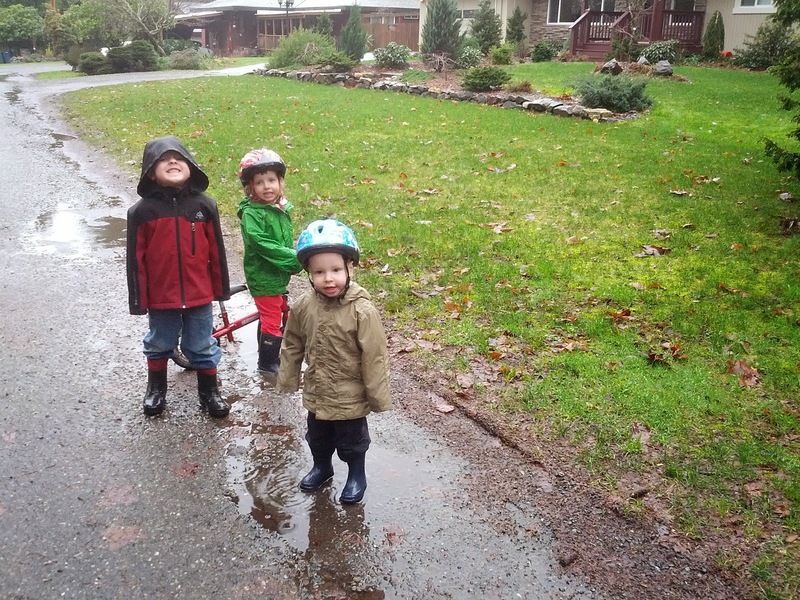 All of the Knight kids had their rain coats washed three times last week. It would have been more if I had washed them faster. 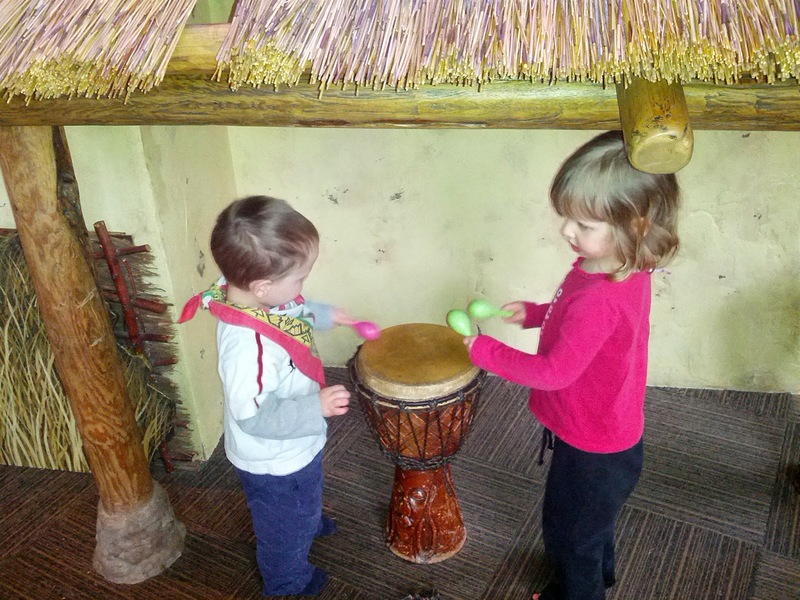 I hope no one is getting tired of seeing pictures of these children at the zoo, because they are certainly not getting tired of going. Here they are looking at a bunny. Cheyenne: this is the biggest of the bear hats you made us for Halloween right before B was born. Can you believe he is that big? 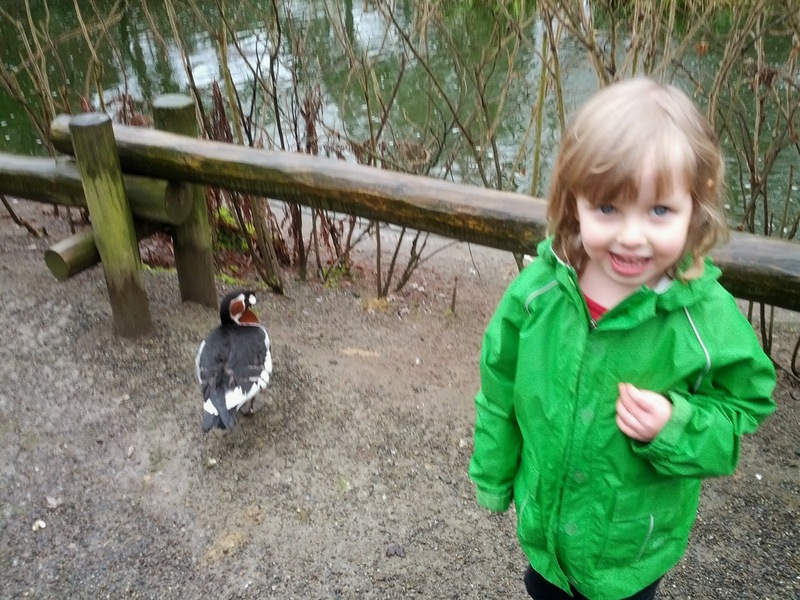 Our zoo day on Wednesday was a great day for looking at birds. They were very lively and active for a cool and drizzly morning. 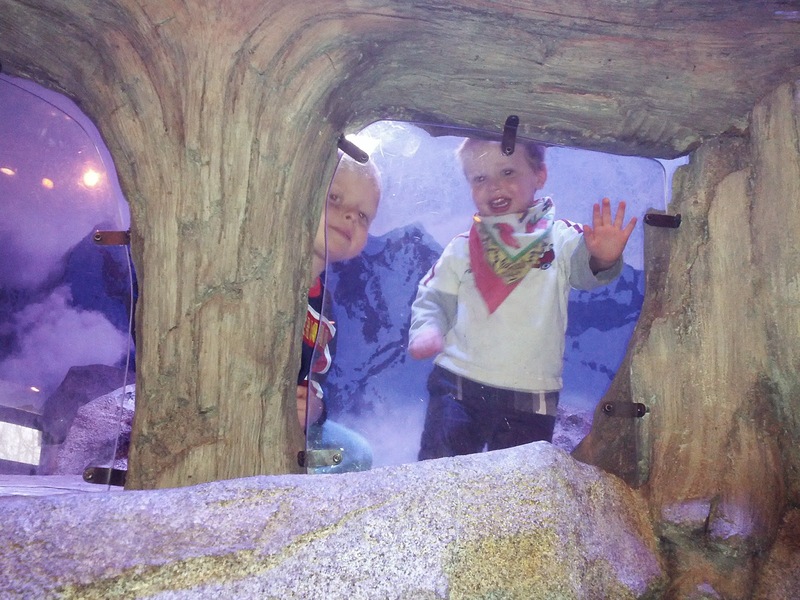 We rediscovered the zoomazium, an indoor playground for kids younger than 8, which we hadn't been to since we got our new membership in September. 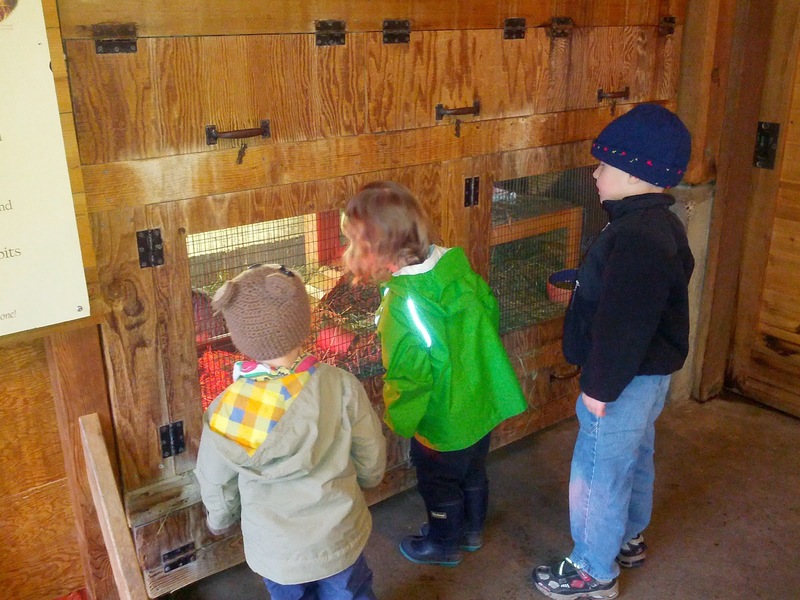 It was nice and dry in there, and the kids got to meet a live lizard and dance to animal music. B's bandanna is a bib to catch snot and slobber, but it doubles as a scarf on chilly days. He has been battling a minor cold all week. The cold hasn't been bad enough to slow him down. It doesn't even really seem to bother him in the daytime. He was deeply torn between wanting to go everywhere Jared goes, and not wanting Mom to be out of his sight ever. Eloise has no such attachment issues. She just loves to run and climb. Everyone would probably have been happy if we had only gone to the zoomazium, but we were trying to finish a zoo scavenger hunt that we started on our last visit. . .
. . . and B wanted to see the penguins. 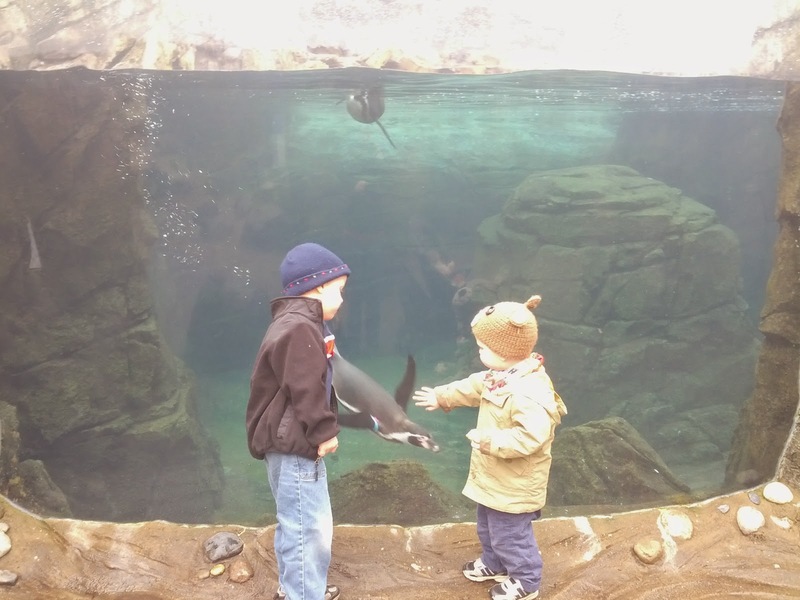 We learned that our zoo has 45 penguins, including some juveniles who hatched last spring and haven't turned black yet. 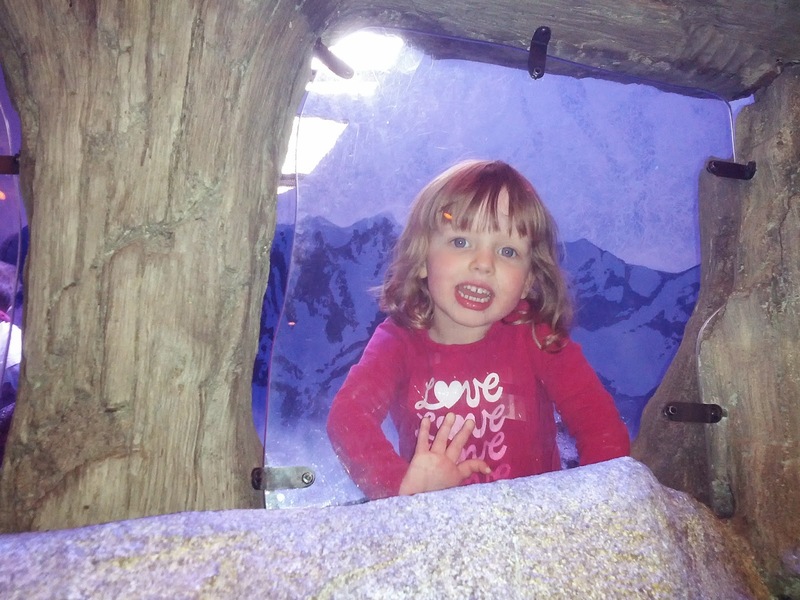 Their exhibit also currently houses a wild Blue Heron, who likes to eat the fish that the penguins leave. The penguins are performers. Eloise was very interested in finding out what kind of food each animal likes to eat. She would ask me to read signs to her and then wait for me to ask, "So is this animal a carnivore, an herbivore, or an omnivore?" She is pretty good at answering that question correctly. I think a lot of this animal interest is due to a current obsession with the PBS show "Wild Kratts," which is the subject of Lego building sprees and daily games around our house. Eloise and B were ecstatic when we copied the Kratt brothers and did a "creature rescue" on Friday, moving a large worm off the parking lot at the YMCA before it met the fate of countless other worms we saw smashed on the parking lot. Jared was sad that we carried out the creature rescue while he was still in his swimming class, so that he didn't get to participate. On this trip to the zoo, I learned that komodo dragons have bacteria in their saliva that gives their prey blood poisoning, even if the komodo's bite doesn't finish them off. The komodo, which can survive on less than one pound of food a day, can lumber slowly after its prey and eat it at the dragon's convenience when it succumbs to the poison. Yuck. 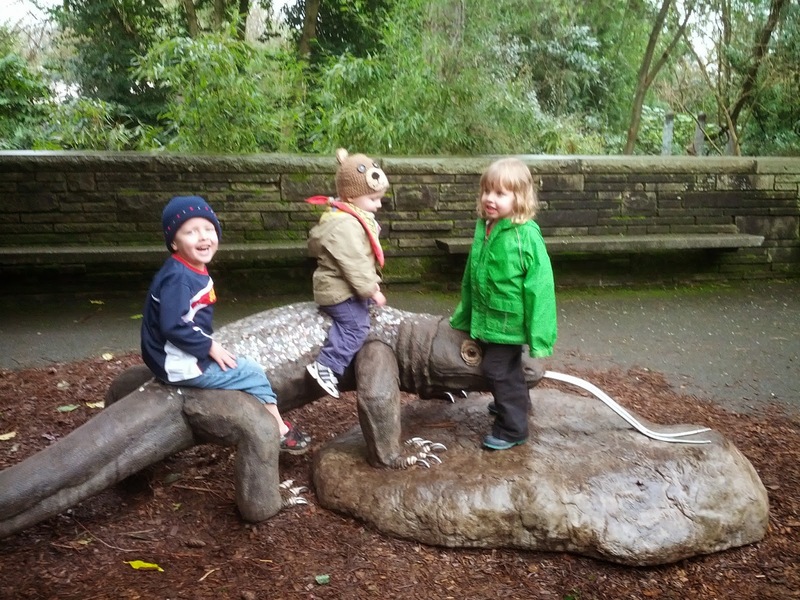 It's a good thing this komodo dragon is made of bronze. In spite of the rain, the hippos were in their pond, snorting and whuffling like an old diesel engine trying to start. All of the children thought that this was a special performance just for them. 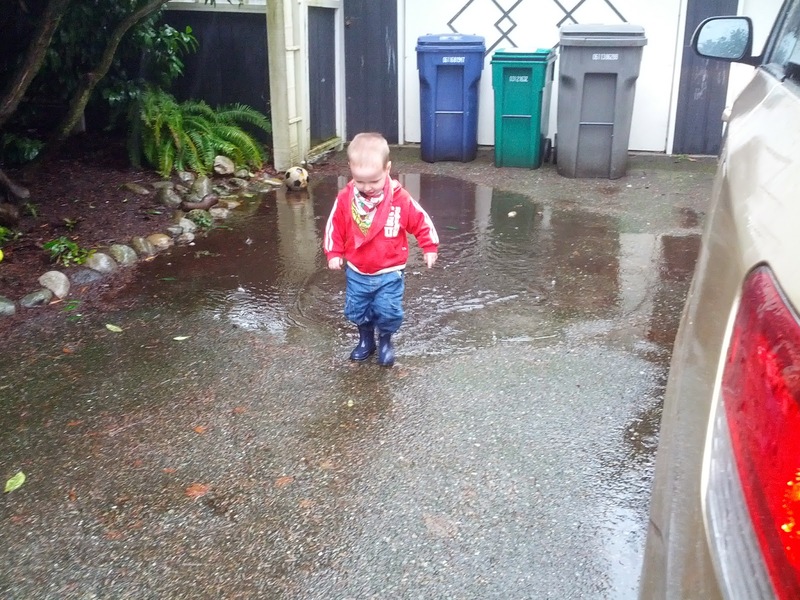 Immediately after we left the hippos, B ran into a puddle and soaked his sneakers and his pants up to his knees. I think he was telling me it was time to go home, which we did. B in the stroller without shoes or socks in the drizzling rain drew a lot of funny looks on our way out of the zoo, but another outing was survived. It occurred to me recently that our new baby could come in as little as six weeks, so I had better get the adventures and outings in with my big kids while I can. This is definitely going to be harder in a few weeks. In a tradition made necessary by the interminable bleakness of January and February, we held our annual midwinter beach party on January 31. 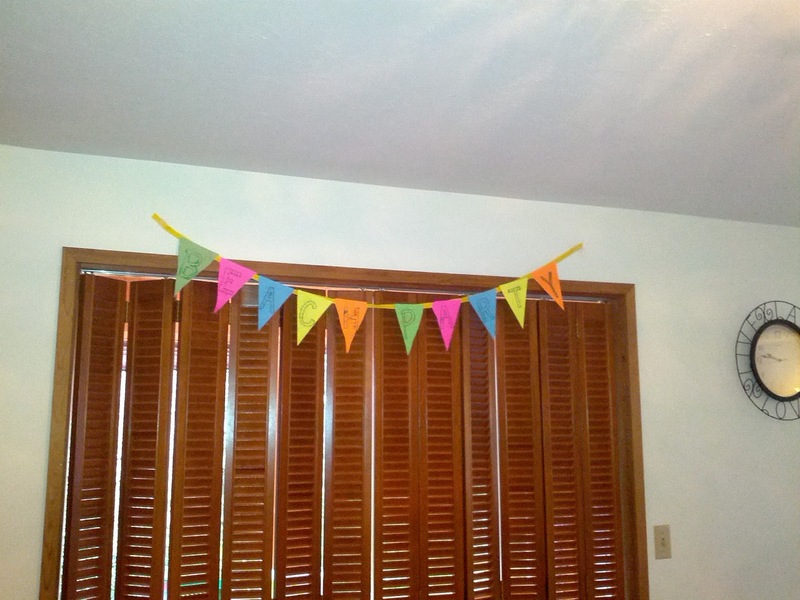 Jared and Eloise were in charge of most of the particulars of the party this year. I'm feeling proud of myself because we were even organized enough to hand out invitations. I had a moment of panic the night before the party when I realized that a total of 21 children had been invited, along with their parents. I had no idea that such a high number of people could potentially show up. 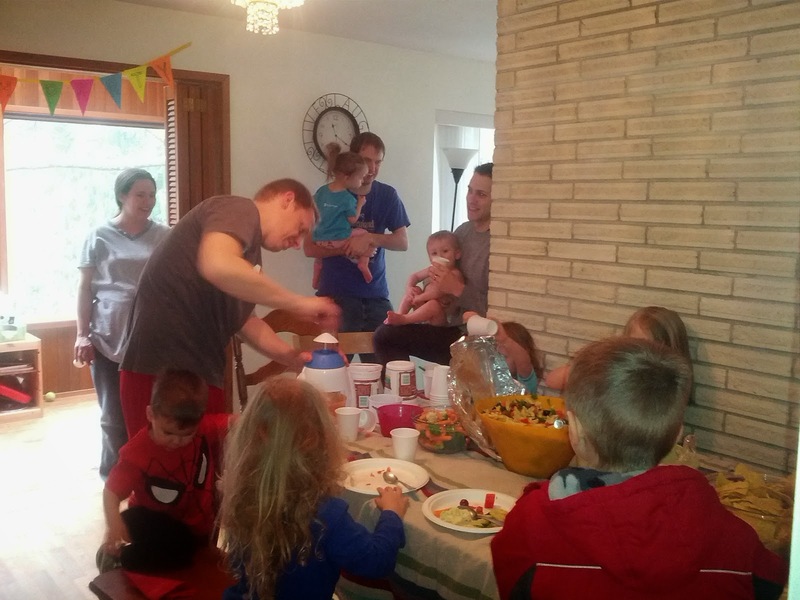 We ended up with a more reasonable 15 children, including our own, and it was delightful chaos. I felt a little silly explaining our beach party tradition as we handed out invitations the week before the party in very un-wintry weather. We had sunshine and temperatures around 60. Fortunately the day of the party dawned bleak and foggy, so we were vindicated. The slush we made was probably the highlight for most of the kids. We tried freezing it in round discs that fit in our snow cone machine, but Todd says that this method is not efficient enough for future parties. I think his arm got tired. Not having learned our lesson last year, we again attempted sand in the house. I did remember how much our vacuum protested at having to pick up 5 lbs. of sand last year, so I moved the sand to a hard floor. The result was a lovely sanded spot on the wood, all ready for a new coat of finish, which we someday intend to put on all of our hardwood floors. B was delighted to wear his "frog shorts." I did not tell him that he was wearing a swimming suit because I did not want him to be angry that we weren't swimming. 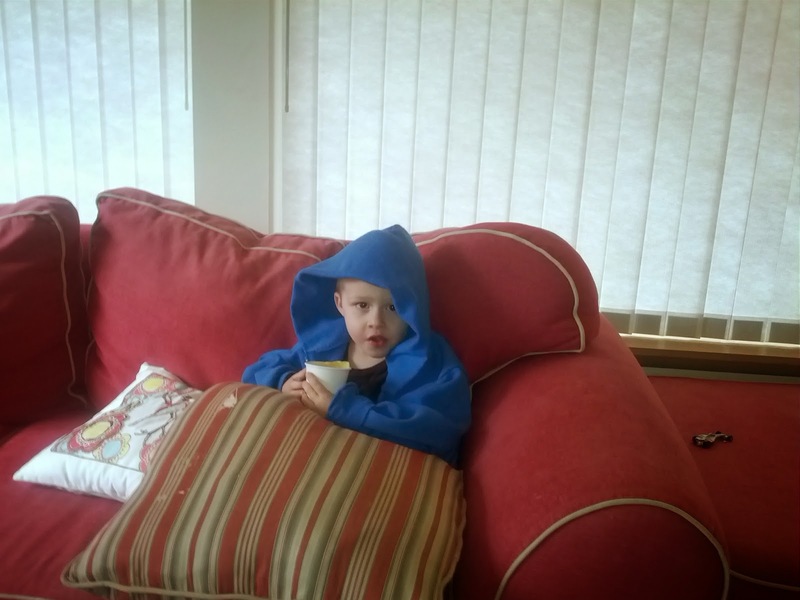 Max and Grant did not think that it was warm enough in the house to be in shorts, especially while holding a cup of ice. 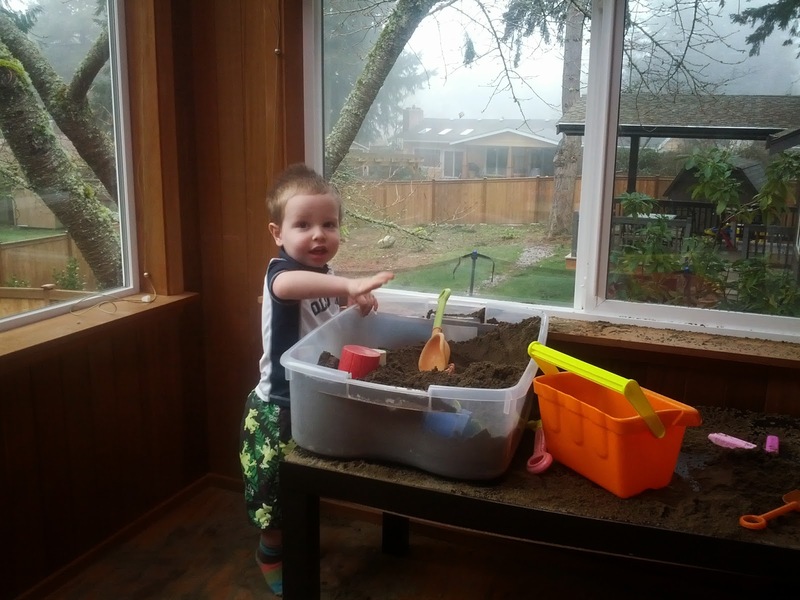 We made kinetic sand in an attempt to thwart the instinct to dump sand all over the floor, but the perpetual dampness of the sand was not enough to keep the sand in the box, especially after B discovered that he could make piles of sand and then make hand prints in them. Our vacuum was very grateful that we did not do this on carpet. 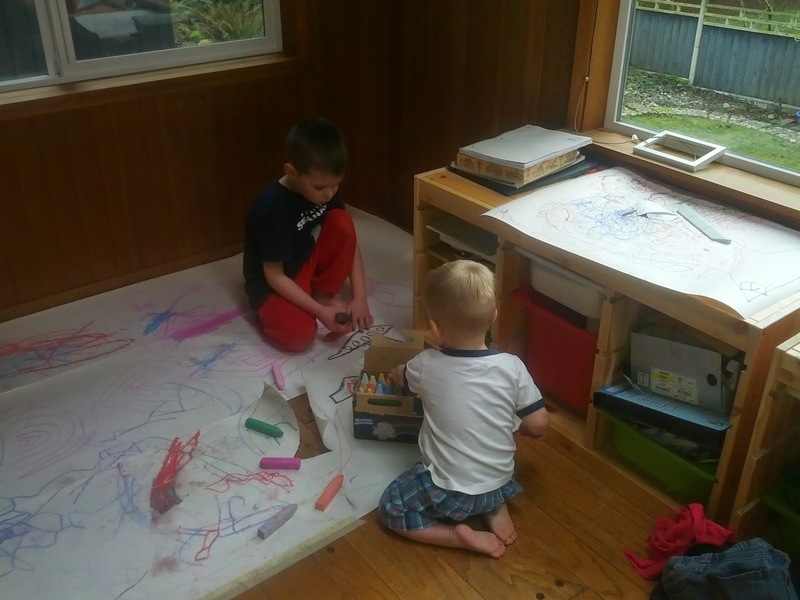 We taped paper to the floor so that the kids could make a giant mural out of sidewalk chalk. We also had a table set up with legos and coloring pages, and we moved our smallest bike and scooter into the basement for the small kids to ride around on. It was a great party. Jared made the right call insisting that we hold our party on a Saturday so that dads could come. Even Todd had a good time. I don't know how I managed to not get a single picture with Jared in it. I promise he was there. Eloise made it into the background of a couple of pictures. 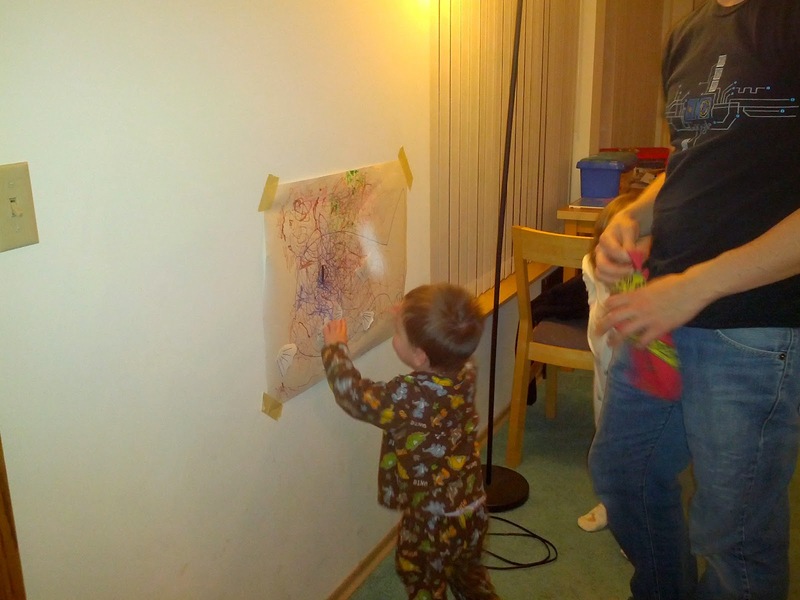 Jared was so busy having fun that he said that we should not bother playing this "Pin the fins on the fish" game that he conceived and Eloise created. We saved it for our family home evening activity instead. The great thing about hosting a party is that you get to continue enjoying all of the things prepared for the party after all of the guests are gone. I might just have to put on a winter coat and get myself a cup of slush.